Brunei Second Minister of Foreign Affairs and Trade Dato Seri Paduka Haji Erywan bin Pehin Datu Pekerma Jaya Haji Mohd Yusof will pay an official visit to China upon invitation from June 13 to 14. During Second Minister Dato Seri Paduka Erywan Yusof’s visit, State Councilor and Foreign Minister Wang Yi will hold a talk with him. They will exchange views on China-Brunei relations and regional and international issues of mutual interest. The China-Brunei relationship enjoys a sound momentum for development at this point. Brunei Sultan Haji Hassanal Bolkiah Mu'izzaddin Waddaulah paid a successful state visit to China last September, during which President Xi Jinping and he jointly made a top-level design for the development of China-Brunei relations. The sides have taken the building of Belt and Road as an opportunity to achieve remarkable outcomes in our practical cooperation in various fields. This year marks the 5th anniversary of China-Brunei strategic cooperative relationship and the 15th anniversary of China-ASEAN strategic partnership. We hope that this visit will strengthen our communication with Brunei and move forward the China-Brunei relationship. Q: According to reports, the leaders of the US and the DPRK met and signed a joint statement on realizing peace on the Korean Peninsula today. What is China’s comment on that? What role is China going to play in realizing peace of the Peninsula in the future? A: The international community is closely following the DPRK-US summit in Singapore. 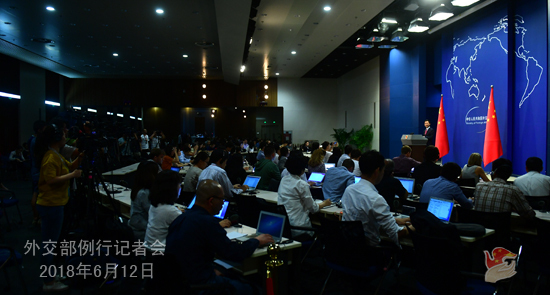 At noon, State Councilor and Foreign Minister Wang Yi already made statements on this. He pointed out that after more than half a century of confrontation and even hostility between the DPRK and the US, now the leaders of the two countries have sat down together for talks on equal footing, which is of important and positive significance in itself and indeed history-making. China welcomes and supports this, as this is what China has been looking forward to seeing and striving for. China hopes that the leaders of the US and the DPRK will remove disruptions, build mutual trust, overcome obstacles and reach basic consensus on and take substantive steps towards promoting and realizing the denuclearization and establishing the peace mechanism of the Peninsula. We hope relevant parties will work for this goal and China will continue to play a constructive role to this end. China is keeping a keen eye on how the situation evolves. We will give our official response as the situation further unfolds. Q: Firstly, will Chairman Kim Jong Un stop in Beijing on his way back to the DPRK? Secondly, State Councilor and Foreign Minister Wang Yi said this morning that nobody can doubt the unique and important role China has played and will continue to play in the Korean Peninsula issue. We know the long history of China’s involvement in this, but recently Chairman Kim Jong Un came to Dalian and before that he came to Beijing. Can you enlighten us as to what happened in these two meetings that contributed to this very important and unique role? A: Recently, Chairman Kim Jong Un has visited China twice, during which he met with President Xi Jinping. Regarding the meetings, the Chinese side issued very detailed readouts and I believe you can still remember that. With regard to the Korean Peninsula issue, China is always committed to achieving the denuclearization of the Korean Peninsula, upholding the peace and stability on the Peninsula and resolving the relevant issue through dialogue and consultation. To this end, China put forth the “suspension for suspension” initiative and “dual-track” approach. 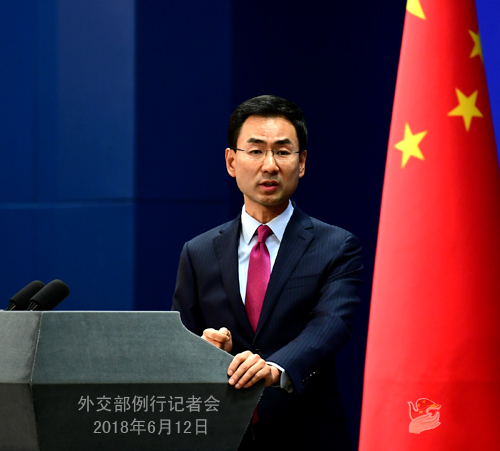 The facts have proven that the China-proposed “suspension for suspension” initiative has been materialized and now the situation is also moving forward in the direction of the “dual-track” approach. The DPRK-US summit is what China has been looking forward to and striving for all along. We have kept calling upon the DPRK and the US, the most important parties directly concerned regarding the Korean Peninsula issue, to engage in direct dialogue, establish mutual trust and peacefully resolve the issue through political and diplomatic means. It is fair to say that the relevant approach and initiative proposed by China and its endeavors in frequent interactions with other parties have played a positive and constructive role in getting the situation on the Peninsula to where it is now. Follow-up: Will Chairman Kim Jong Un stop in Beijing? Is he here to refuel or talk or do something else? A: I took similar questions yesterday. I would like to say for now that at the request of the DPRK, Chinese airline will continue to provide relevant services for the DPRK delegation. Q: The Chinese side once said that sanctions on the DPRK are not the end. Now as the situation is easing and changes are unfolding, will China facilitate the lifting of sanctions on the DPRK as soon as possible? Reports say that there are signs that China is easing relevant sanctions. What’s your response? A: First of all, to come straight to the point, I shall reiterate that China has always implemented all DPRK-related resolutions adopted by the Security Council in a serious and strict manner and faithfully fulfilled our due international obligations. This is very clear. Second, regarding the issue of lifting sanctions on the DPRK you mentioned, the relevant Security Council resolutions stipulate that we shall adjust sanction measures as may be needed in light of the DPRK’s compliance, including suspending or lifting relevant sanction measures. China always believes that sanction itself is not the end, and the Security Council’s actions should support and conform to the diplomatic dialogue and the endeavour for the denuclearization of the Peninsula at this point, and promote the political settlement of the Peninsula issue. Q: This morning the Ministry of Foreign Affairs released the information that Bolivian President Juan Evo Morales Ayma will visit China. Could you tell us the schedule and arrangements of this visit? What are China’s expectations for the development of China-Bolivia relations? A: This morning we announced that Bolivian President Juan Evo Morales Ayma will visit China. This is President Juan Evo Morales Ayma’s fourth visit as well as his second state visit to China. During this visit, President Xi Jinping will hold the welcoming ceremony and welcoming banquet for President Morales. The two heads of state will hold talks and attend the signing ceremony of cooperation documents. Premier Li Keqiang and NPC Chairman Li Zhanshu will meet with President Morales on separate occasions. In recent years, China-Bolivia ties have achieved remarkable development as evidenced by ever stronger political mutual trust, steady progress in economic cooperation and trade, fruitful exchanges and cooperation in such areas as culture, education, sports and science and technology and close coordination in international affairs. Our bilateral relations have become an example of South-South cooperation featuring equality, solidarity and mutual assistance. We believe that the visit of President Morales will achieve fruitful outcomes and open a new chapter in China-Bolivia relations. Q: First, Air China’s two planes are now flying to Singapore, one of which is the same plane that took Chairman Kim Jong Un to Singapore. Has China invited Chairman Kim Jong Un to visit China and meet with President Xi Jinping on his way back to the DPRK? Second, what is China going to do in order to learn more about the DPRK-US summit? A: As to the matter of planes, I already gave my answer just now. I would like to restate it. At the request of the DPRK, Chinese airline will continue to provide relevant services to the DPRK delegation. As for the specifics you asked about, if you’re really interested, I would suggest that you closely follow the situation and the situation will be unfolding in due course. 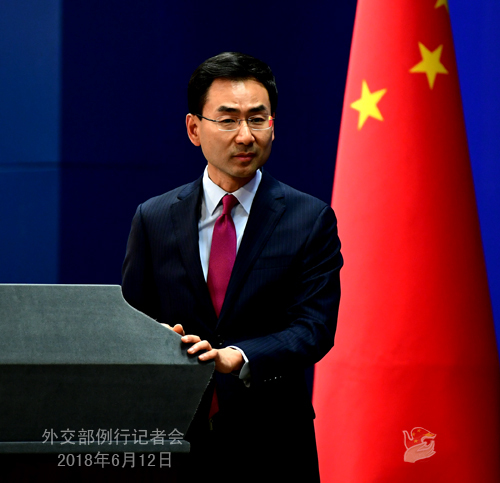 Regarding the second question, as an important party to the Korean Peninsula affairs, China has maintained close communication and coordination with all relevant parties as always. Follow-up: Has China invited Chairman Kim Jong Un to visit China by far? A: You are a regular attender at our press conference. You may be aware that if there is an important high-level exchange, we will usually release the information in a timely manner. Q: Last week, US Secretary of State Mike Pompeo said that he would visit China following the DPRK-US summit this week. Can you confirm it? A: You may have noted that the US Department of State has issued relevant information on it. The Chinese side welcomes US Secretary of State Mike Pompeo’s visit to China on June 14 and the two sides remain in close communication on it. If we have further information, we will release it in a timely manner. Q: First, who is US Secretary of State Mike Pompeo going to meet in China? Second, the spokesman of Hong Kong Indigenous Edward Leung Tin-kei was sentenced to six years in prison yesterday for rioting. Former Hong Kong governor Chris Patten said the relevant legislation violates international human rights and has been abused. A British Member of Parliament also said that the Hong Kong SAR government used the law to intimidate the “pro-democracy movement” and curtail freedom of expression. What’s your reaction to that? A: Regarding your first question, like I said, we welcome US Secretary of State Mike Pompeo’s visit to China on June 14. As for the specifics you are interested in, the two sides are in close communication on the specific agenda of Mr. Pompeo’s visit. If there is any more information, we will release in a timely manner and you may follow that. For your second question, Hong Kong is China’s special administrative region, and the Hong Kong affairs are entirely China’s internal affairs. We firmly oppose the interference in Hong Kong SAR’s judicial and other affairs by any external forces. As for the specific case you asked about, I would refer you to relevant department. This is not a diplomatic question. Q: The leaders of the US and the DPRK agreed to work towards lasting and stable peace on the Korean Peninsula in their meeting today. What does China expect the US to offer in terms of security assurances to the DPRK? Does China believe that the US should suspend or cancel joint military drills with the ROK or does China expect there to be a reduction of US troops in the ROK? A: China is always firmly committed to realizing the denuclearization of the Korean Peninsula. Meanwhile, we also believe that the DPRK’s legitimate security concerns should be taken seriously and addressed in the process of denuclearization. The political settlement of the Korean Peninsula issue at this point is moving in line with the dual-track approach proposed by China. As positive progress is made in the process of denuclearization, relevant parties should take positive measures regarding establishing the Peninsula peace mechanism and addressing the legitimate security concerns of the DPRK. China stands ready to continue to play a constructive role to this end. Like I said, China is keeping a keen eye on how the situation evolves. We will give our official response as the situation unfolds. Q: It is reported that a “dedication ceremony” for the new Taipei office of the American Institute in Taiwan (AIT) will be held on June 12. Marie Royce, the US Assistant Secretary of State for Educational and Cultural Affairs attended the ceremony. What is your comment? A: We are gravely concerned about relevant reports and have lodged stern representations with the United States. I must point out that the US, by sending officials to Taiwan under whatever pretext, severely violates the one-China principle and three China-US joint communiques, interferes in China’s internal affairs and exerts negative impact on China-US relations. We urge the US to honor the commitments it has made to the Chinese side on the Taiwan issue and correct its wrong actions, thus avoiding undermining China-US ties and cross-straits peace and stability. Q: Both you and State Councilor and Foreign Minister Wang Yi mentioned establishing a peace regime on the Korean Peninsula. Replacing the armistice agreement with the peace agreement is one aspect that has drawn attention from the international community. When does China think is the appropriate time to sign the peace agreement? A: Like I said just now, currently, the political settlement process of the Korean Peninsula issue is moving forward in line with the “dual-track” approach proposed by China. As positive progress has been achieved in realizing the denuclearization, all relevant parties should take positive measures in terms of establishing a peace mechanism on the Peninsula and addressing the DPRK’s legitimate security concerns. As a major party to the Korean Peninsula affairs and a signatory to the armistice agreement, China has the responsibility and obligation to play its part in replacing the armistice agreement with a peace mechanism. We will continue to take an active part in the peace process of the Peninsula and make due contributions to achieving the denuclearization, establishing a peace mechanism and upholding peace and stability on the Peninsula. Q: China hopes to continue with its constructive role in the peace process of the Korean Peninsula. Could you elaborate on it? For example, whether China will participate in the negotiation on the peace agreement? Whether China will join the denuclearization verification? Whether China will provide security guarantee to the DPRK? A: I have talked about it just now. I can repeat it for you. As a major party to the Korean Peninsula affairs and a signatory to the armistice agreement, China has the responsibility and obligation to play its part in replacing the armistice agreement with a peace mechanism. We will continue to take an active part in the peace process of the Peninsula and make due contributions to achieving the denuclearization, establishing a peace mechanism and upholding peace and stability on the Peninsula. As to the details, I believe that with the evolvement of the situation, we will get a clearer picture.